Happy Holi My friends.. How was your Holi? Did you guy have fun ? I sure did. This weekend was so packed and fun filled for us. To let you in on a secret this was our as in P and my first holi as in we have been married for sometime but neither of us really play holi. The last time I participated in the festival of colours when I was 10 years old and that is a pretty long time ago. I am not for playing holi, actually, I am not comfortable with the whole mess, the water colour, the muck and all. As a child I remember hiding in far corners of the house so as not to be discovered by my friends. After a while my final exams began clashing with holi so there was no question of playing. Therefore, over the years the interest and the desire to play holi dwindled. Then I was married to a man who like me had the same listlessness and detachment for the festival and hence it never occurred to us to celebrate the occasion. I will be honest though, I love the food that comes with this festival. The sweets the savoury and what not. This year though it was different, like every year the festival brought very little interest to our lives. 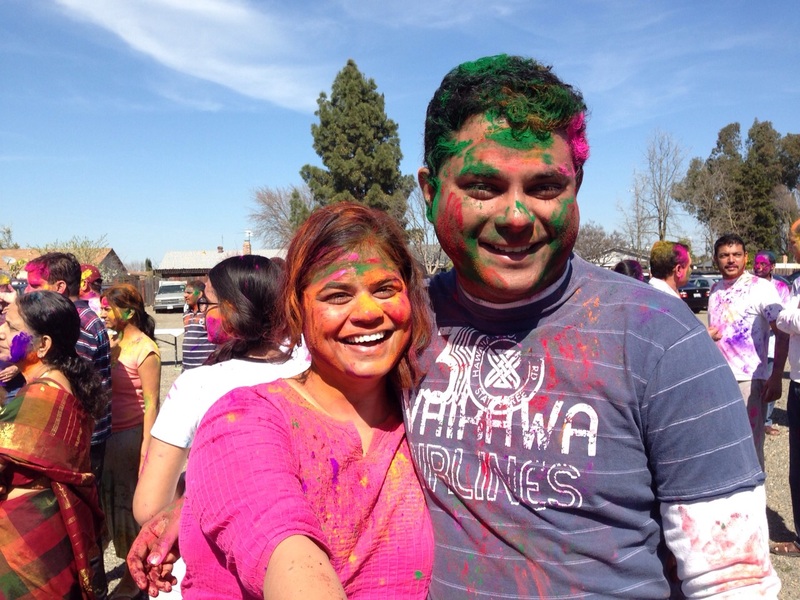 Then a friend of mine , I will call her N and her husband K and their super cute son R invited us to a holi party in downtown Sacramento. As usual I was apprehensive and looked for every possible excuse to dodge the event, and I was a bit under the weather so, I had almost made up my mind of not going, but N asked me a couple of times and she was so sweet and then she promised me that it is just powdered colour and no water colours or as she puts it not “Gandiwali holi” or dirty holi. P was indifferent, he was like chalo agar chalna hai; dekhlein US mein holi kaisi hoti hai ( Let us go if you want to; let us see how they celebrate holi in the US). After much deliberation and debate, we decided to take the plunge. But I am glad we did. It was so much fun my friends N and K along with their son R and my other set of friends D and P with their son A were also there and we played with beautiful powder colours and lots of music, food and dance. I will admit P and I did have a lot of fun. The remainder of the week was fun as well. P and I went on a dinner date on Friday, the dim lights music and candle light kind of dinner and on Sunday we met up with friends for a wonderful full on Bengali lunch. So in all this I hardly cooked anything over the weekend and I did really want to eat some home cooked comfort food. 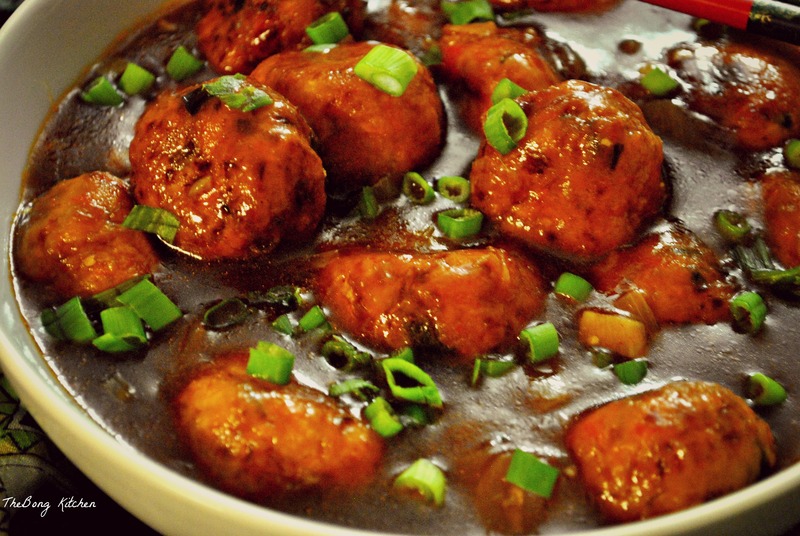 Though I did not manage to make any of the holi specials but I did make one of my favourite comfort foods, Vegetable Manchurian balls in gravy. 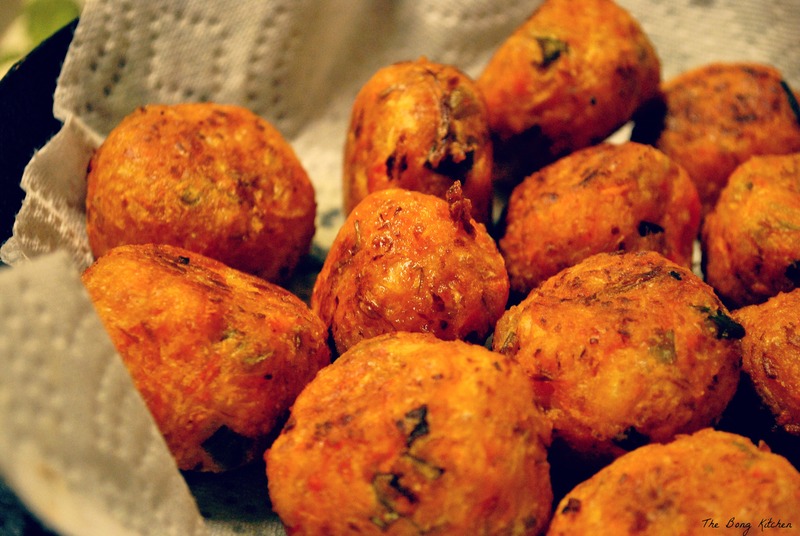 I have cooked this dish so many times but never really managed to blog about it. 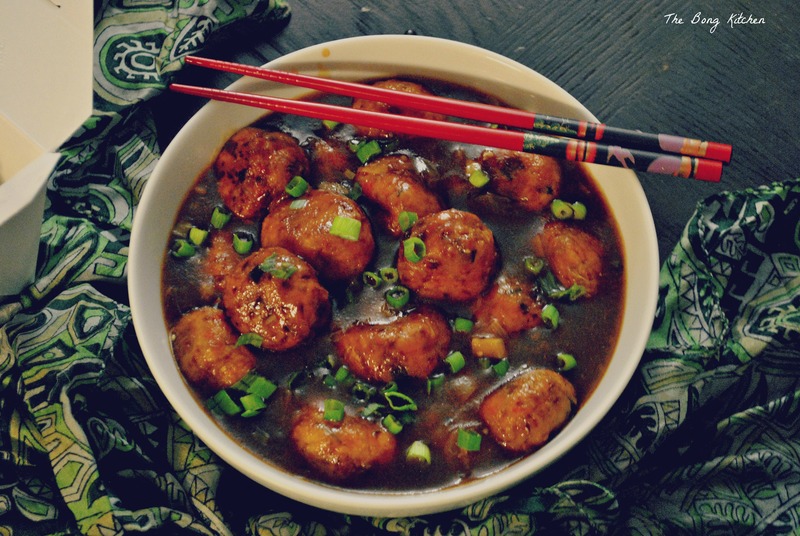 These deep fried vege beauties simmered in a lip smacking tangy gravy made with a delicate mix of sauces. I like to serve with plain rice or garlic noodles on the side. Start by chopping the vegetables very finely. I used the shred attachment for the food processor. One vegetable at a time. In a separate bowl mix the sauces and keep it aside. Next take the flour and cornflour salt and pepper in a bowl and add the vegetables to it and mix well. You may need to sprinkle some water to bind the vegetables, I did not add water because the vegetables had enough water to hold the flour mixture. Now take the mixture and make equal sized balls. About 1/2 the size of a golf ball. My mixture yielded about 20 of them. Next heat the oil for deep frying and depending upon the size of your wok fry about 3-4 balls at a time and then soak the excess oil by resting them on a paper towel lined plate. Now in another wok/kadhai heat 2 table spoons of oil, then add the minced garlic, the whites of the spring onions and once they flavour the oil add the green chilies and the onions. Saute the onions for a couple of mins, make sure they do not become limp. Now add the sauce mixture along with the sugar salt and a pinch of white pepper. Now add a cup and a half of water to the sauce and let it simmer. Next add the cornflour to the sauce and continue to simmer for another 5 mins. 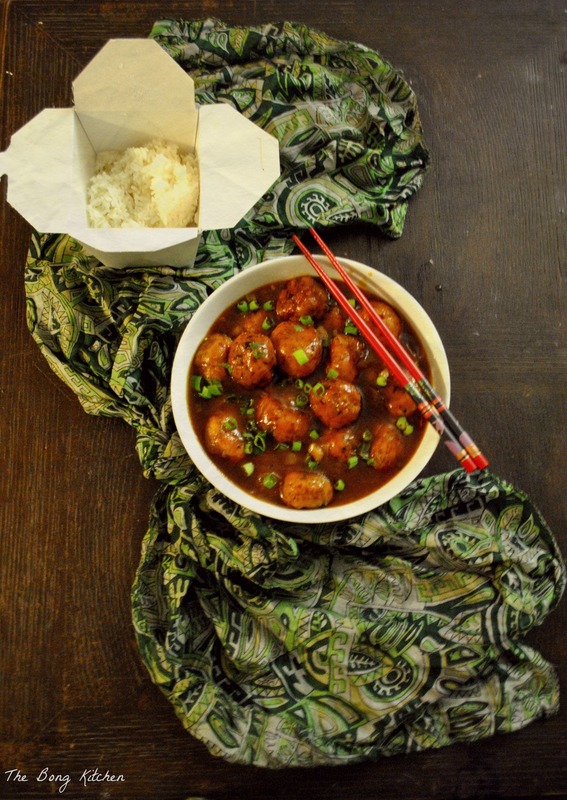 Next add the Manchurian balls and mix carefully so they do not break and simmer for another 3-4 mins. Garnish with the spring greens. Serve with rice on the side. You can replace the vegetables with cauliflower or even chicken. Be careful with the water, we do not want the balls to be soggy and they would break apart.